Lately I switched Meds and it feels like I have brand new tires, rolling amused. A bit confused, but I’m going forward. With caution. During a conversation with a friend the other day, he suddenly asked me what it felt like to have Parkinsons. Do I have pain? What are my symptoms besides the tremor? I had to stop and think about how I can explain why the sleepless nights from PD are different than my husband’s sleepless nights. Why some symptoms could be a function of age, but are really part of PD. Then I tried to explain what internal tremors felt like. There is so much more I could have said, but I decided to just say that each person with PD has an entirely different trajectory and that I could not speak for others. When I got home I started thinking about the best way to approach the question of what it feels like to have PD is to ask other Parkies to tell me how it feels for them. I asked a number of my Parkie friends to answer the question. Here are some of their answers. 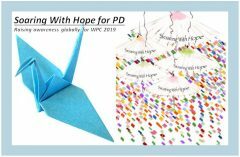 I hope that this will give some insight into the many manifestations of PD, both physically and emotionally, whether or not you live with the disease. As you read, you will start to see many commonalities in these statements, which I will talk about next week. It’s the strangest feeling knowing what your future is. You can keep the disease at bay with exercise and diet, but eventually it’ll overcome you. But the way I look at it, everybody gets something …. so I got Parkinsons. I won’t let it define me, not today, not tomorrow and hopefully not in the future. At the end of the day, all we have is hope. And that I won’t ever let Parkinson’s take that away from me. At least I hope it won’t. When I am feeling my symptoms which I do periodically, sometimes 3 times a day as my medication is wearing off and sometimes less, I feel more rigid. I do not have a tremor. If I happen to be walking, I feel a slight difficulty moving with the ease I feel when my meds are fully kicked in (When they are working I feel perfectly normal). I compensate by taking big, exaggerated steps with big arm movements and usually in about 20 minutes the symptoms subside. I can also feel slightly dizzy (another symptom which led to my diagnosis of PD). This, too goes away as my medication kicks in. Otherwise I feel very good. I have energy, I sleep reasonably well, I feel alert mentally, and I feel capable physically. Knowing that I have Parkinson’s has made me appreciate my life, and life in general. It gives me a more acute awareness of the need to be awake, present and to try to live every moment well. For me, the lack of knowing what’s going to be in five minutes is one of the most difficult challenges. Sometimes I am so stiff that I can barely move, at other times, my voice is soft and barely audible. And yet, at other times, no one would ever dream that I have Parkinson! It’s so unpredictable! Also, my walking. I used to LOVE walking, and literally raced through the streets of Jerusalem. Today, although sometimes I can walk normally, albeit slowly, at other times I literally crawl, and because I must often think about my steps, i no longer find walking a pleasurable activity. I feel as though I am losing part of myself, slowly, and not consistently, and that is, most probably, the most difficult challenge of all. I am one of the rare people who was diagnosed on the spot, one day after I noticed that something was wrong. That neurologist was brave to diagnose a young 44 year old female presenting with no tremor. That was 15 years ago. Since then, my life has actually improved. I had successful DBS 6 and 1/2 years ago, which gave me back my independence. I have been lucky enough to afford to give up work and travel around The World, often incorporating seminars, Walks and Congresses on Parkinson’s. But how do I feel at this present stage? I am becoming more and more unbalanced every day. I stumble a lot in the mornings, banging into walls to stop myself. But I am an optimist. I still ride my bike once a week along beautiful St Kilda Beach, I still drive, and have 2 overseas trips planned, including fulfilling my role as an Ambassador to The WPC in Kyoto, Japan next year. I have a very supportive husband, family and friends, and I am very active in my local Parkinson’s community, residing on The Board. I may be slowing down, but life for me is still good. What Parkinson’s feels like for me: When I get out of bed I can barely walk. I hold onto the tables and the wall to just make it to the bathroom without falling . I take my meds and hopefully they will kick sooner than later. But until they do, I shuffle my steps and don’t lift my feet very high. I experience rigidity when I move. This feels like someone is pushing me backwards when I am trying to go forward. When I walk, my toes on my left foot begin to curl which is very painful. And if I forget to take my meds in the middle of the day, my gait becomes very bad and I get a lot of pain in my Achilles heel on my left side. Everything that I play or need to do always takes longer. But everyday I feel blessed to be here and thankful for my wonderful family and friends. I have good and bad days. I even have good and bad hours in a day. But I get up and do my best to live now and make the most out of it. Since I’m relatively a rookie in this process I feel like there are so many curves ahead in the road, it’s foggy and my car has no bright lights. I feel strangely at ease from the comfort of the car. But I’m just not sure where I’m headed to. It’s been 5 years now and I’ve been waiting for my first major calamity. So far I’ve only taken one fall as an official Parkinsons patient. Helping my daughter pack up from college I took a fall at the front door. She didn’t see me fall, which was important to me since I fancy myself her own personal bodyguard. Lately I switched Meds and it feels like I have brand new tires, rolling amused. A bit confused, but I’m going forward. With caution. Thank you for putting into words we sometimes do not want to say or even think. I was diagnosed 1 year ago but have known for 5. My Mother and her Mother both had it and I saw very early in my life what it is and does. The meds and support today makes it a very different disease than when I watched my Mother succumb to it in 2005. Having a caring support community is huge compared to the stigma and the feeling of having to hide it that was the mentality of Her time. Hopefully my journey with PD will be kinder than hers was. My fears are from Her worst experiences. My Grandmother didn’t even go to the Dr. because in the mountain country of West Virginia they didn’t have a clue what was wrong and she died at a young 68. my Mother lived with it for 33 years. Having said all this, we are indeed fortunate and blessed to be living in a time of those who truly want to make a difference and a cure. My PD isn’t visible yes but I did have a D- Scan and that’s where the found it because I was developing migraines and slight tremors. He even said something negative about that too. Sorry to hear you have had a bad experience with your doctor. Because this is a doctor you will have a long term relationship with, I would suggest looking for a new neurologist, and preferably a Movement Disorders Specialist, who is a neurologist with extra training who specializes in Parkinsons. Since your doctor said “that he doesn’t specialize in those areas”, look for someone who does.